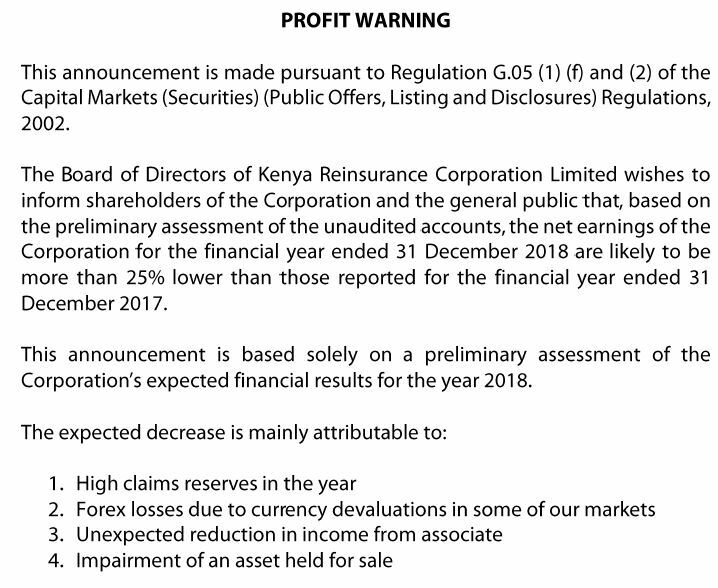 The re-insurer has issued a profit warning. Things not cool. Huh! You are still invested in gava firms. I think they should have 2 levels of profit warnings. One for below 25% of prior year profits. and another for swinging to loss making. In this case, looks like they still have room to make profits, but the warning covers everything including a swing to losses. Hope so too. In the meantime, serious supply at 12.50! How does land get impaired? Shida na Title Deed? Not the first time for KenRe. They once owned land in the middle of a forest/park! Which are the other 2 firms to go bust except ARM? Did they get rid of that Arap mashamba proxy? Mmh! When is Mwirania's contract ending? 1) I still need to provide you with the info so you can send the money for the bet I handily won. 2) No prayers needed. I have CASH in the bank post KK looking for a place park it. Centum? NIC? Equity? 3) KenRe is the only core holding that's GOK-controlled . I am open about it. Let's see the damage on 29th March. If it is not as bad as feared and the prospects are good for the long-term, then I am in for more. I will hold on. Let's see what happens down the line. Will this be a KPLC/KenGen? Or a KK? If it becomes a KPLC... you can gloat. And what is "Grand Master of the Order of the Most Ancient Welwitschia Mirabilis"??? When I was offered 3:1 Rights in KQ, I knew it was time to bail. Uwizi tu. Especially when Naikuni and Mbugua chose not to buy (meaningful) shares in KQ. If I am offered an "Open Offer" in KenRe, I will exit and lick my chops.